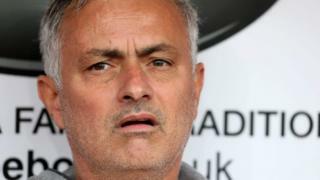 Manchester United manager José Mourinho has reached a deal with the Spanish state on a one-year suspended sentence in a long-running tax fraud case, Spain’s El Mundo newspaper reports. The Portuguese national was also fined about €2m (£1.8m; $2.3m), it says. He was accused of owing nearly €3.3m in undeclared image rights revenue for 2011 and 2012, when he was Real Madrid manager. Mr Mourinho said earlier he had paid all the taxes he owed. He is not expected to serve any time in jail because Spanish law states that a sentence of under two years for a first offence can be served on probation, according to Reuters news agency. The BBC has contacted Mr Mourinho’s representatives for comment. Spanish authorities launched the image rights case against Mr Mourinho in June last year.